Organ & Bongos - ZineWiki - the history and culture of zines, independent media and the small press. 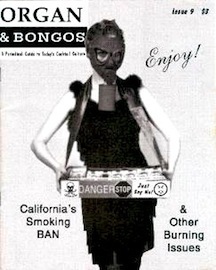 Organ & Bongos was a zine by Russ published in Seattle, Washington, U.S.A.. Organs & Bongos, subtitled, "A Periodic Guide to Today's Cocktail Culture" was dedicated to the mid-'90s revival of lounge culture, cocktails and easy listening music. It was published in the 1990s and at least thirteen issues appeared. Organs & Bongos published items such as an interview with musician Brother Cleve Duncan, from the band Combustible Edison, on the death of Swing; an article by Bosko on swizzle sticks, and a short history of cabaret. Some issues also have tiki related articles. A piece on Dean Martin's alcohol intake was excerpted in The Factsheet Five Zine Reader. Tim J. Anderson, in his 2006 book Making Easy Listening: Material Culture and Postwar American recording, is not sure how to take it all. He writes; "In last summer's issue of Organ & Bongos, a D. Hume reports getting into 'The 2nd Annual Tiki Mug Party' for a dollar instead of six by bringing his own mug, and a lounge singer, Joey Altruda, dubs the sunken living room in his rented apartment 'The Ski Lodge'. Sometimes the make-believe affluence is funny, possibly even subversive, but just as often it seems to be a cover for frustrated desires to be rich." This page was last modified on 24 May 2018, at 12:50.